I often get asked what is my favorite piece of furniture I have built. Although there have been many pieces I've loved, I am especially proud of my World Market "Aiden" Knock-off. This is the first piece I welded by my self, and it totally fits my style. After sharing my "Aiden" with you, I had a great response! It seemed like most people thought it was impressive, impressive but too difficult to try. When I share difficult techniques with you guys, my goal is to show you it CAN be done. I'm a girl. I am a hairstylist, not a construction worker. What's holding you back? If you think something is cool, then try it! Why can't you learn to weld, or dovetail, or dado? Make sure you're being safe, and ask a friend for help before you start. Maybe you don't have a cool friend? Look into local classes. Woodcraft stores, for example, offer dozens of specialty classes to the public, and I promise, they let girls in too (wink wink). Now, off my soapbox. 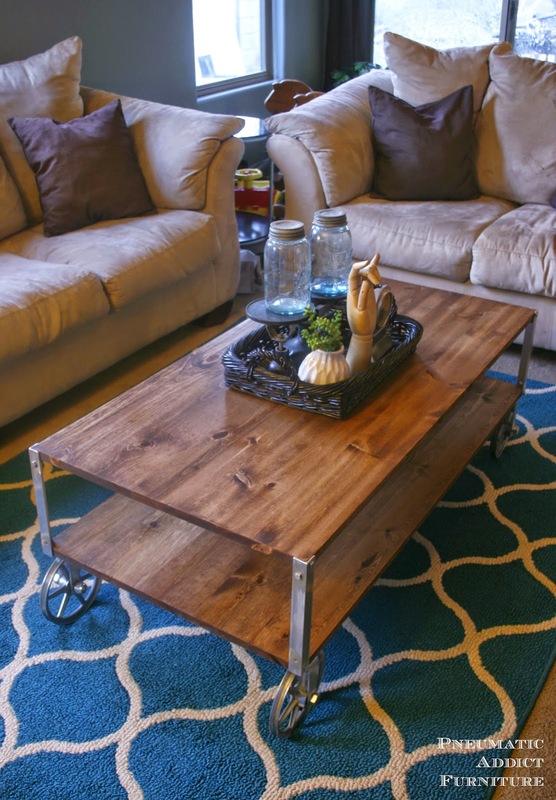 So, regaurdless of all the reasons why you should give the hard stuff a shot, I thought I should come up with a cool, industrial coffee table that was a little simpler to make and didn't require many tools. 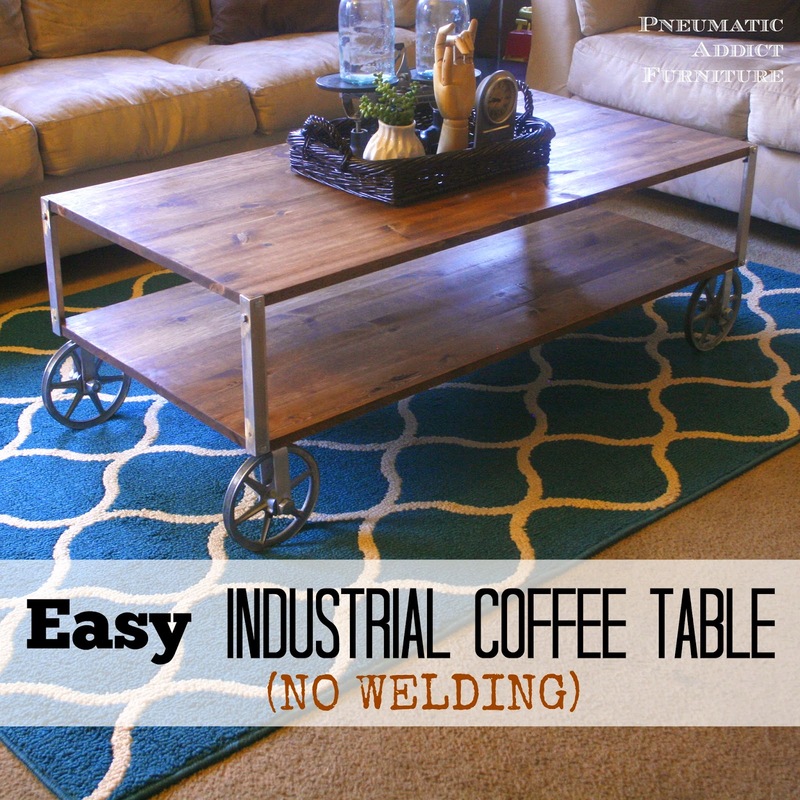 I saw plans for Ana White's Easiest Industrial Cart and thought "why not make that into a coffee table?". So, that's what I did! Good news for you if you are new to working with metal. 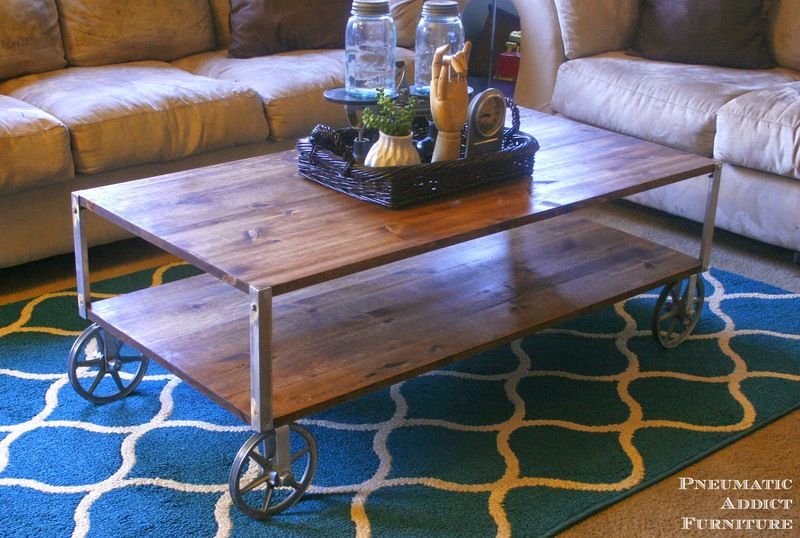 This table uses aluminum, which is very easy to work with. You can find Ana's plans here. My method is very similar, but with a few changes. 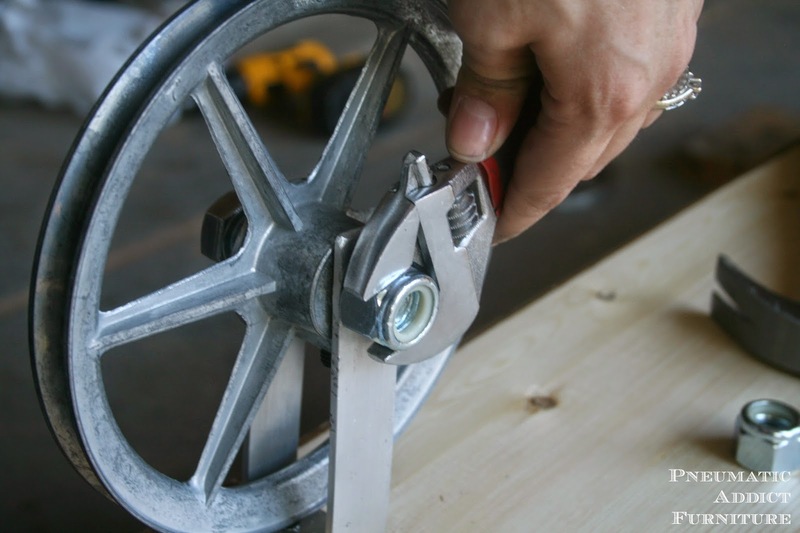 To start, you are going to want to use an angle grinder, not just a jigsaw. They aren't terrible expensive and it is such a useful tool! Seriously, something you need in your tool box. Also, I like the look of over-sized casters. 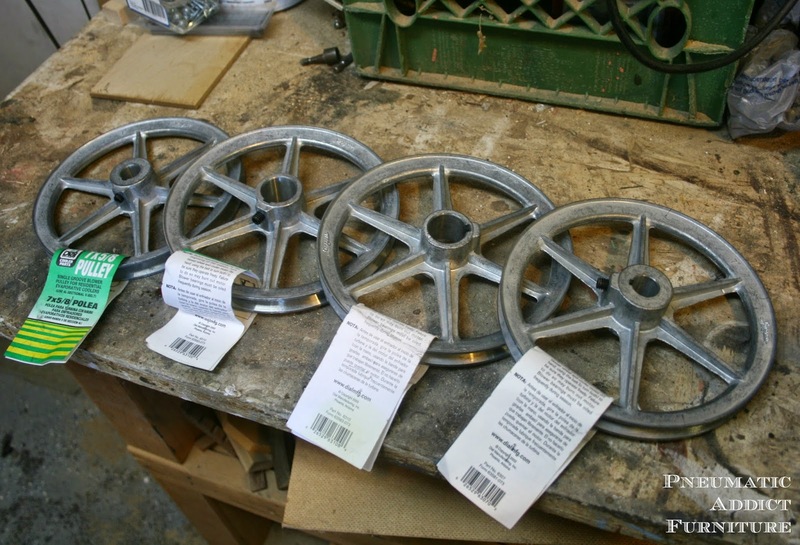 I found these 7" pulley wheels from my local True Value and turned them into casters. Here's a list of everything you'll need. Start with your wood. I picked up 2 of these 2 ft by 4 ft pine project panels at Lowe's for $22 each. I originally planed to use plywood and band the edges with wood veneer to save a little money, but as I shared on Instagram, the 110 degree heat wasn't going to let that happen. 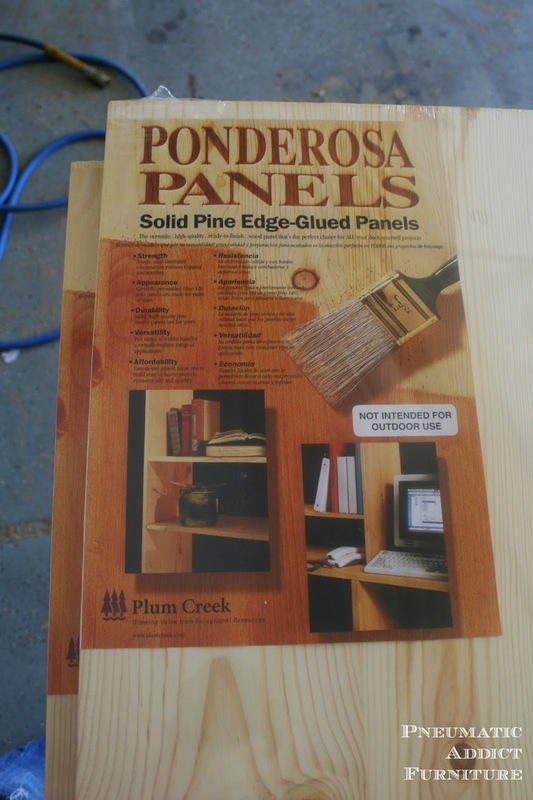 The project panels are still reasonably priced, and solid wood. You may need to trim off or end the ends. Mine were pretty rough, so I ran them through my table saw and trimmed off about 1/8" from both ends. You could just sand them down with some 60 grit. Give the whole panel a light sand with 150 grit paper, and make sure to soften the hard edges. Now, you can finish it however you want. If you wanted a really smooth, glossy looking wood, I would continue to sand with higher grits. I wanted mine to look a little rustic. I used some pre-stain conditioner on mine and then rubbed on a coat of Special Walnut stain. Once dry, I applied 2 coats of wipe-on polyurethane, and 1 coat of DIY dark wax. Now to bust out the aluminum. Using the angle grinder (make sure to wear gloves, hearing, and face protection), cut 4, 10" pieces of angle aluminum. The aluminum cuts really easily. Use the grinding wheel to smooth sharp edges. 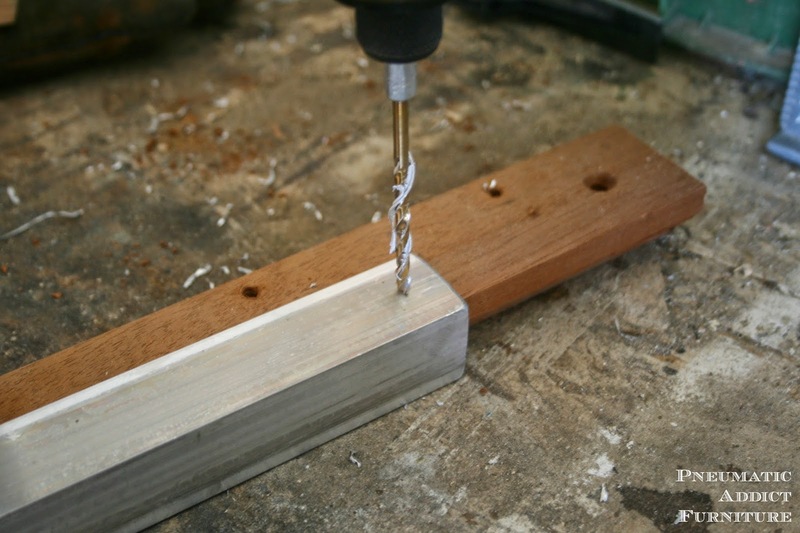 On one side of each piece, drill a 1/4" hole, 3/8" from either end. Drill two pieces the same, and the other two mirrored (when you are looking at them, two should have holes on the right side of the angle, and two should have them on the left). Flip your first project panel over on it's face. 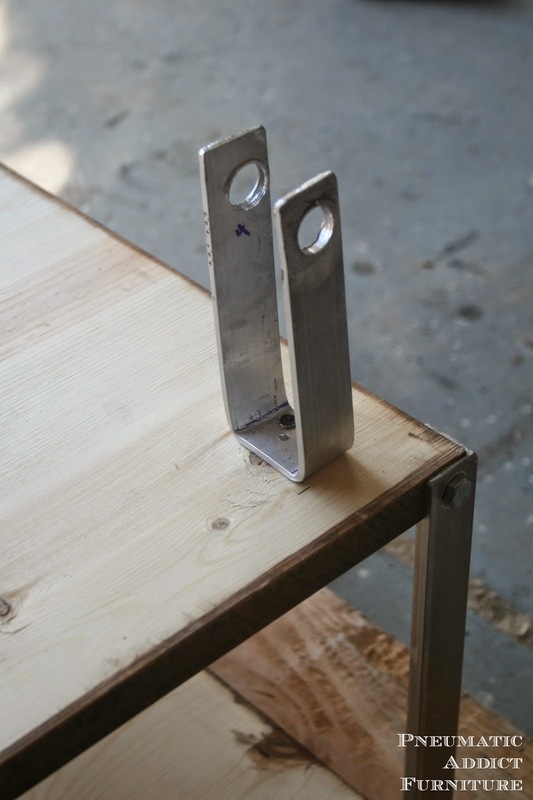 Its helpful to use a workbench or sawhorses. Now, to attach the aluminum to the wood, you want to use lag screws, but it is SUPER important to pre-drill the wood first! Lag screws are really good at causing wood to split. 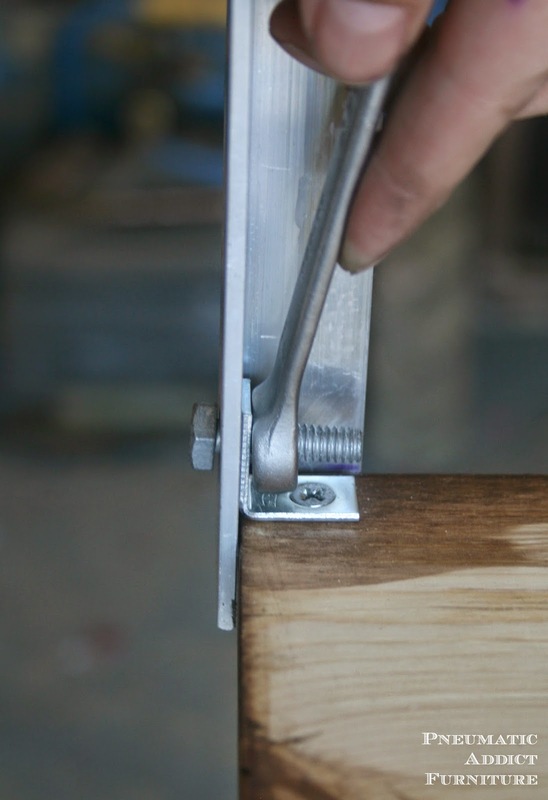 Little tip, if you hold a piece of scrap wood under the edge of the panel, you can make sure the aluminum is flush with the wood while pre-drilling your holes. Drive in your lag screws (this is when you will be kissing your impact and nut setter). 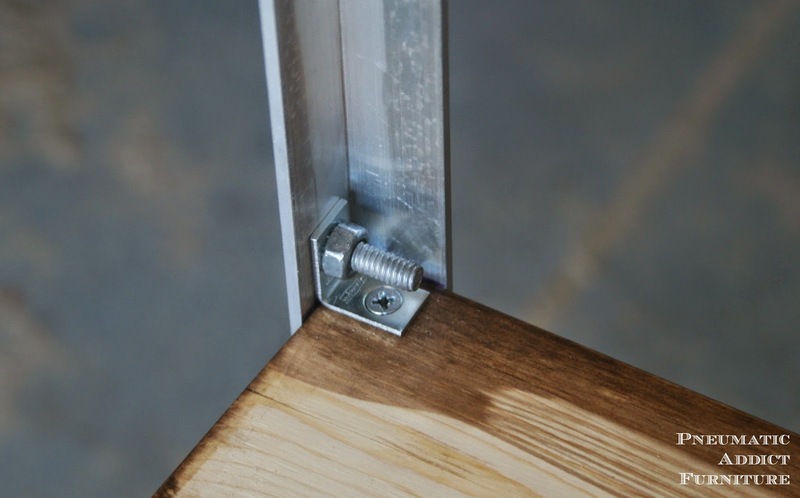 Grab one of the L-brackets and place it in the opposite corner of the lag screw, inside the aluminum. Drill a 1/4" hole through the hole in the bracket and through the aluminum. Stick one of your 1/4" hex bolts through both holes, just barely. This will help hold the bracket in place while you screw it down. Using 1/2", #8 wood screws, screw down the L-bracket to the panel. Once attached, use a wrench and nut setter to tighten down the bolt. Attach the 3 other aluminum legs the same way. Lay your second project panel, face up on some scrap blocks. Line up the first board and aluminum legs. 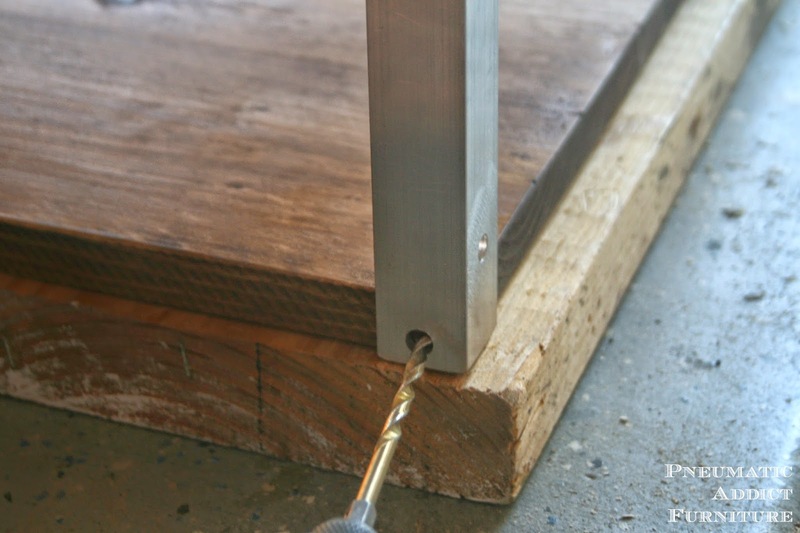 Once in place, pre-drill the holes for the lag screws; being on blocks makes it much easier to drill straight. 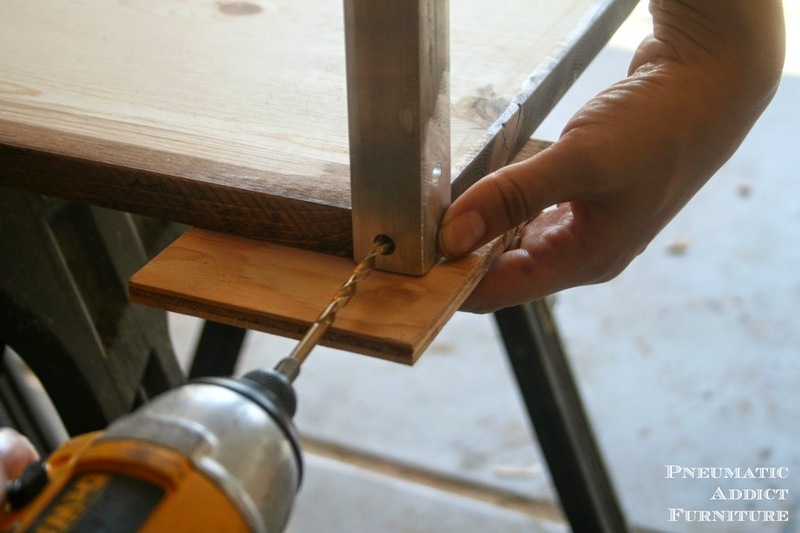 Secure the second project panel the same way as the first, but with this one you will have to attach the L-brackets to the top of the wood, not the underside. Flip the piece over and attach your casters. This is where I first placed mine, but after seeing it upright, I thought they looked better further out and moved them. What do you think? Could you give it a shot? P.S. if you love it, its available under the "Shop" tab. I love this!! And, so easy to do!! Thank you for sharing.. This is beautiful. I love the final result! I am not afraid of power tools, but we don't own any beyond a power sander and a drill. :) Someday! 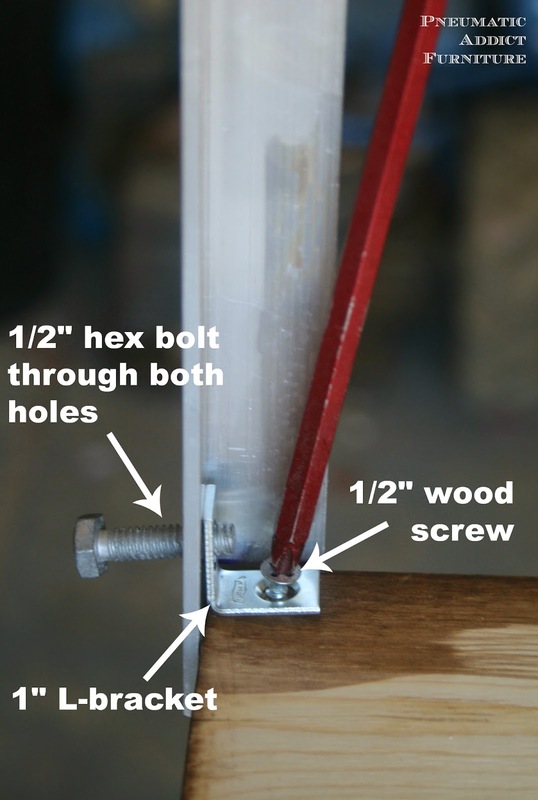 To get the bracket for the casters to line up with the L brackets (I think I'd rather have one long line), just attach the bracket for them with just a wood screw (and a washer maybe)? Elisha, you are a gem. What a marvelous tutorial and shopping list. When I am back on my feed, I am copying THAT! Yay! 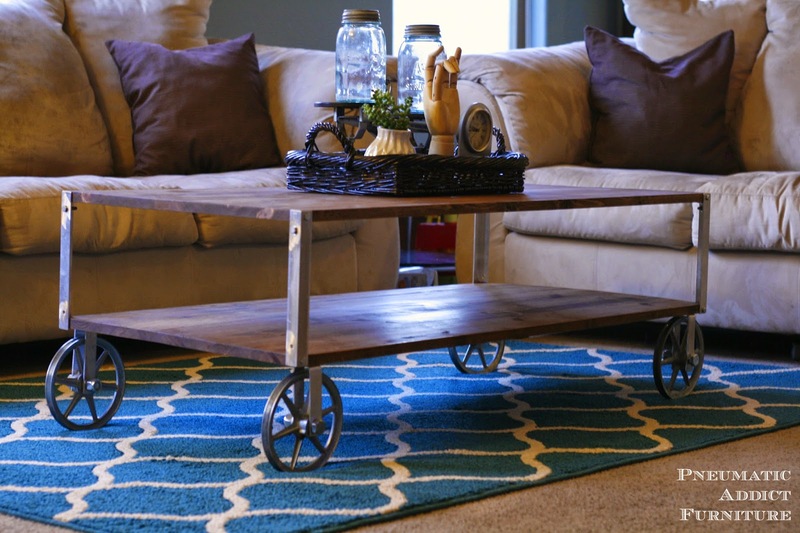 I love it, and I too saw Ana's cart and thought about making something...except I was thinking end table. The wheels are so great! Pinned! Do you know what the final cost is on this build? It looks amazing! Thanks Chloe! It was about $70, not including finish or casters. The casters cost me another $70 to make. Oh my gosh, you are a creative genius! 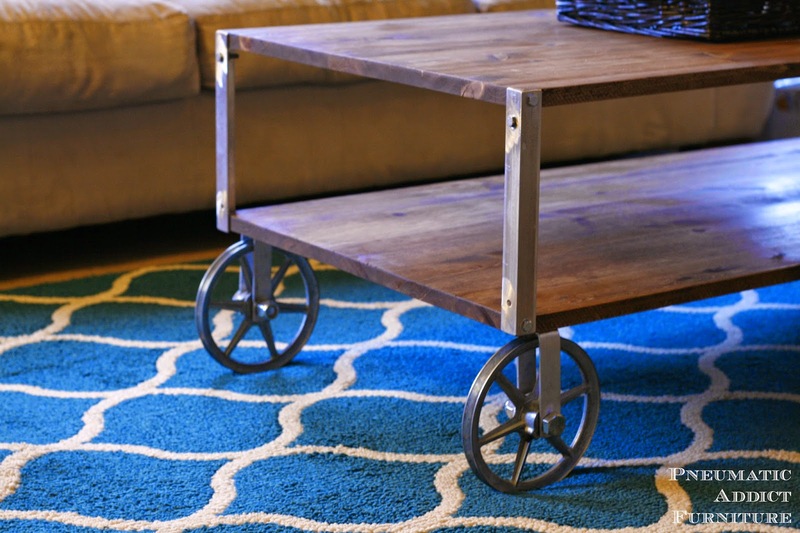 Love how you made the casters and will have to give this a try someday. Pinned! Thanks for sharing this over at The Makers! This is so great! Seriously! Pinning! We are featuring you tomorrow over at The DIY'ers! It's gorgeous! So much like the table I want from West Elm. Respect my friend. Gotta love a gal who can talk angle grinder. Love the results. Thanks for the tutorial...totally gonna give this a go! Really like the pulley wheels, just had a question on the u shaped brackets used to attatch the wheels, did you make those or purchase. thanks. I made them. In the tutorial "How to turn Almost Any Wheel into a Caster" I explain how I did it. I bet if you looked around, you may find something pre-fabbed that would work. Really a great post to read. Thanks for sharing. I will try to make a new one. It could be better if you attach a video with this article. Unfortunately this is not as basic as it sounds.